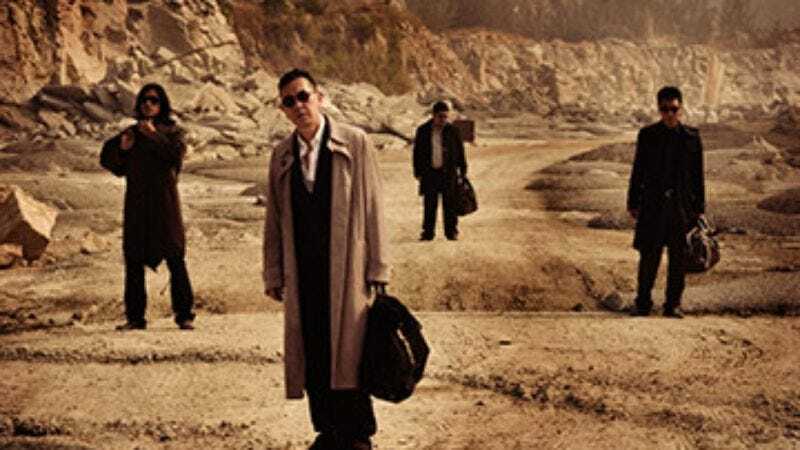 The beginning of Exiled drops viewers into the middle of a triad potboiler, which is never a bad place to be when Johnnie To is at the helm. It's 1998, and mob enforcer Anthony Wong has been assigned to execute Nick Cheung, who has betrayed their boss and fled to Macau, a resort colony that will be handed over to the Chinese government in 24 hours. When Wong arrives, he finds Cheung married, with a new baby, and with some of his ex-colleagues standing ready to defend him. It's a classic To standoff, full of shifting loyalties and balletic gunplay in improbably tight spaces. But after about 20 minutes of guys in shades staring down loaded guns and firing warning shots at inanimate objects, Exiled moves on to the great outdoors. The gang members join forces, head for the hills, plan an armored-car robbery, and eventually ride back into town for a final showdown in a saloon. Exiled becomes a back-door Western, and though To switches around some of the signifiers—using a baby's ankle rattle as a substitute for jingling spurs, for example—he retains the mythological resonance. Setting Exiled in pre-handover Macau could be read as a political comment, cut with nostalgia for the way China's "special administrative regions" used to be wide-open and more than a little dangerous. (It's funny and telling that the local law enforcement lets this little gang war play out, since they'll be off duty for good at the end of the day.) But the locale is primarily a clever way to make a Western without going too far into the past, and To takes full advantage. His outlaws swill whiskey before their climactic shootout, after spending a carefree hour around a campfire, talking about how they're going to spend their stolen gold. Nothing about Exiled is as resonant as To's best work, but it's a clever homage to Sam Peckinpah, right down to the clouds of bloody mist that fill the barroom as To's anti-heroes make their last stand.